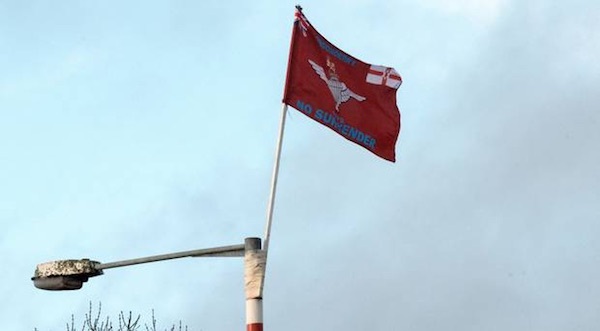 Flags of the British Army’s infamous Parachute Regiment have once again been erected by loyalists in County Derry in an attempt to inflame tensions ahead of a march for justice on the anniversary of the Paras’ Bloody Sunday massacre. Thirteen civil rights demonstrators died after members of the Parachute Regiment opened fire in Derry’s nationalist Bogside on January 30, 1972. A 14th person died later. The flying of the killer regiment’s flags has been branded provocative, disrespectful and hurtful to families of the victims. They appear every year in the village of Newbuildings in the run-up to the anniversary of the killings. Kate Nash’s brother, William, was among those killed on January 30, 1972. Her father was among the 28 people shot who were shot but survived. Ms Nash said that the flying of the Para flags is a hate crime which is always ignored by the authorities. “This has become a regular feature for some people in Newbuildings, Drumahoe and in some parts of the Waterside, but I cannot understand why we are forced to put up with this year in and year out because to me this is a hate crime,” she said. Sinn Fein councillor Christopher Jackson called on unionist politicians to get the flags removed. “Given the brutal history of the Parachute Regiment in this city, the erection of these flags is provocative and disrespectful and clearly designed to hurt the families who had loved ones murdered and injured on Bloody Sunday,” he said. “It is also an effort to raise tensions in the greater Waterside area at a time when many others are working night and day to ease community tension and build peace. “I would call on unionist leaders in our city to ensure that these flags are taken down immediately,” he added. Meanwhile, a large number of groups in Derry have confirmed that they will support the forthcoming Bloody Sunday March in Derry later this month. Five republican groups have now said they would now take part in the march on Sunday, January 27. Several organisations pulled out of last year’s march over the apparent hijacking of the long-standing Bloody Sunday justice campaign to promote unrelated issues. Saoradh, The Irish Republican Socialist Party, Independent Republican Councillors, 1916 Societies, and 32 County Sovereignty Movement, have now said they will join those Bloody Sunday relatives, the wounded and others who continue to march along the route from the Creggan Shops to Free Derry Corner. In a statement, Saoradh again noted that the original civil rights protest which came under fire had been an anti-internment rally. Setting out their reasoning in a letter, the other four groups stated: “As Republicans, we welcome the fact that the Bloody Sunday March for Justice seems to have returned its focus on putting the responsibility for injustice where it lies - squarely with the British establishment and its crown forces. “The murders carried out in Ireland by the British were and are unjust and immoral. They were carried out on the orders of the occupying forces and a government which clearly has no regard for the families of these murdered Irish citizens, in Derry, Ballymurphy or anywhere in Ireland.